So I should start this post by apologising for my long absence. 2016 was a rough year for me, filled with hospital operations, recovery and heartbreak. I’ll fill you in some other time but today’s post is about the events leading up to a book club I attended on 28 January 2017 in central London that started with uncertainty and ended in laughter. I have been stanning so hard for this book club ever since my friend told me about their first event which I had missed. They posted that they would be having a second book club soon so being the smart cookie that I am (my big forehead houses my big brain) I set up notification alerts on the BGBC twitter handle so as soon as they released the tickets I would be there. I even had my bestie (who does not use twitter) make her account do the same. I was on it like sonic and there was no way I was missing the second event. Why was I so excited? God, how deep do I go on this one? Keeping it simple, I’m a massive geek and love reading. I have cancelled on nights out with friends because I wanted to stay home at reading (I really hope they’re not reading this!). I tried to start a book club with some girlfriends last year but I had way too much going on. Going deeper I went to predominantly white schools all my life (in secondary school I was one of three black girls in the whole school!) and believed the media when they told me black, or rather I, was unattractive. As I got older, I learnt to love myself so don’t cry for me. Over the last year or so it’s felt like there has been an awakening among young (and older) black women about just how awesome they really are. We’ve long been defying the stereotypes of being unintelligent or uneducated but now we were openly and proudly doing so whilst celebrating our magic. And the idea of the black girl book club to me encompassed that. 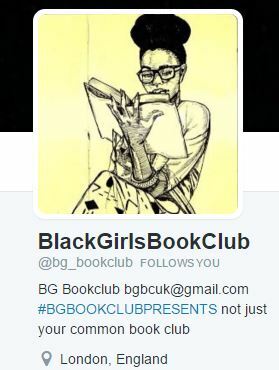 Black women from all walks of life, who enjoy literature, coming together to talk about their not so secret hobby. I get chills just thinking about it. So back to the tickets, it’s November time and my Twitter notifications are on, I’m ready. Now would you believe these trifling heifers decided to release the tickets during the working day! Who does that?!? Not the evening, not the weekend, but whilst I was in a meeting at work with my mobile phone on silent! KMT. Now the BGBC experience began before the book club meeting. Melissa and Natalie sent personal thank you letters to each ticket holder along with the book, which was Maya Angelou’s I Know Why The Caged Bird Sings. I wish I hadn’t been so excited for my book and taken a picture because it was all so purrrty. I read the book when I was 16/17 and didn’t really appreciate the beauty of it. It was powerful, but I was too young to understand the beauty. This time it blew me away. I think in part because whilst listening to Radio 4 a few weeks earlier they were interviewing an author who said that the worst type of fan he had was someone who said they had read his book in a week. He said that that type of person wasn’t appreciating the words on the page, but rather skimming the pages to get the gist and get to the end. He didn’t spend months and years crafting his stories, creating his scenes through metaphors, similes, and bloody adjectives for them to be ignored. It made me think about the way I read as I’ve always been a fast reader, and how I often miss the details. So at the time of listening, I decided that from that moment on I would read books more slowly and take the time to appreciate the labour of love that went into the book. I Know Why The Caged Bird Sings was my first chance to do this. And Oh My God.